Intended to significantly boost the operation of the National Agricultural Research and Extension Institute (NAREI), a five-year strategic plan will soon be introduced. At least this is according to Chairman of the Board of Directors, Dr. Patrick Chesney as he addressed the opening of a Research Conference earlier today in the Plant Science Building, Guyana School of Agriculture. 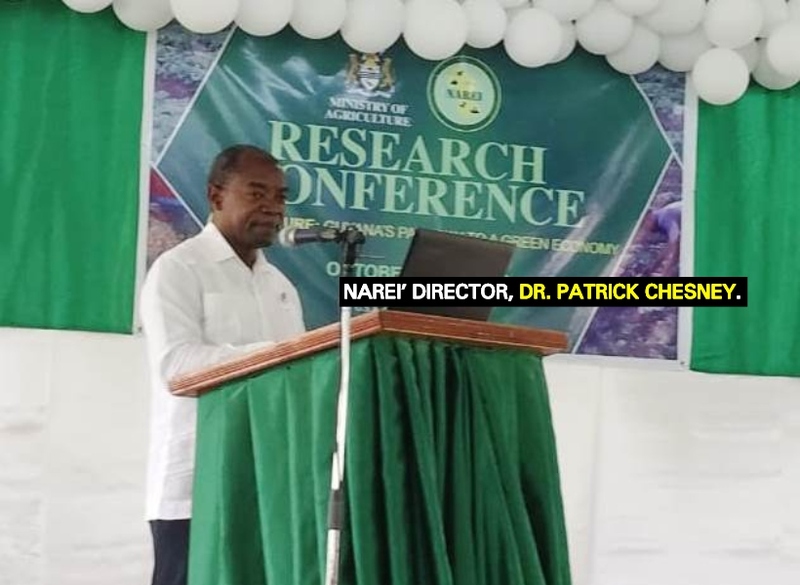 “The Board of NAREI is re-organizing to, firstly fulfill its mandate, and secondly, to significantly contribute to a modern agricultural sector through use of environmentally friendly innovative and relevant research methods and tools for development” Dr. Chesney said. In light of this new shift, NAREI will also be looking at a future collaboration with cooperatives in the 10 Administrative Regions as the institute works to boost its collaborative research infrastructure and programmes. Agriculture Minister, Noel Holder, who also spoke at the event, urged that the Institute work to ensure its mandate gives priority to more enhanced strategies for sustainable and inclusive economic development. According to the Agriculture Minister, targeted research can pave the way for more viable food production in response to growing world demand; sustainable management of natural resources and climate-smart agriculture and balanced development of coastal and hinterland areas and their communities. “It is important for researchers and scientists to continue efforts to bridge the gap between theory and practice, to enable the agricultural sector and farming areas to become more sustainable and competitive and capable of adapting to new challenges.” the Minister said. However, in light of Government’s vision for a Green State Development Strategy, the subject Minister noted that while much is being done in tandem with the objectives, several key areas should be addressed. Among the areas the Minister wants to see addressed are; productivity, sustainability, resource efficiency and rural/hinterland development. Meanwhile, NAREI’s Chief Executive Officer, Dr. Oudho Homenauth, said that while the Institute’s development programmes have been re-oriented from time-to-time on the basis of national and global changes, new challenges confronted today warrants a renewed concept of agriculture. “This renewed concept embraces the entire agri-food/agri-product commodity chain, incorporating the direct and indirect linkages with both rural and national economies as well as regional markets, and the rest of the world” Dr. Homenauth said. He also made mention of successes in the area of spices, carrots, cauliflower, broccoli, sweet peppers in which the institute has seen farmers countrywide benefiting. Guyana is presently self-sufficient in sweet pepper production and the Institute is working to ensure self-sufficiency of the other mentioned crops will be in the not too distant future.